Would zoologists survive an apocalypse? 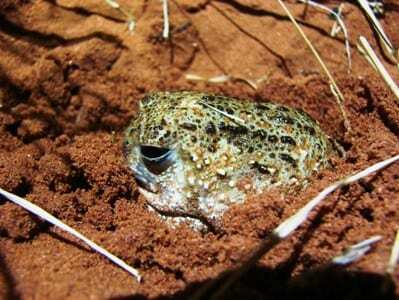 Could knowledge of this water-holding burrowing frog save your life in the desert? It is a well known fact – based on on numerous scientifically accurate feature films – that in the event of the end of the world some people will survive the initial devastation only to find themselves barely surviving in some post-apocalyptic hell. Here I’m exploring whether zoologists would fare better than the average survivor. If the answer is yes, perhaps university biology admissions tutors can add a slide to their recruitment presentations to highlight this additional benefit in what is already the best subject in the world. 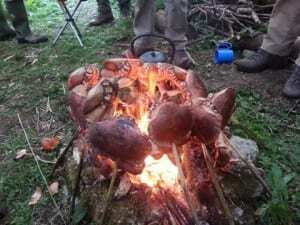 I spent this weekend on a survivalist course deep in the Dorset wilderness for an old friend’s stag do. As kids, along with his two brothers, we had spent our time building shelters in the woods, making fires, distilling mud, firing bows and arrows and generally acting as if the world had already been taken over by luminous slime mould from the future. As teens and students (and occasionally still) we spent our holidays walking in the mountains and not really engaging much with humanity. Wildlife and wild-living have stuck with us all: the stag is now an ecologist, I run a zoology museum (and spend a couple of months a year living in a tent in outback Australia) and his brothers are biology and geography teachers. As a result we are all pretty cocky when it comes to hanging around in woodland areas. This weekend’s course made us all question our ability to actually survive. Should a virus/aliens/a powerful strain of concrete decay/zombies/frozen dinosaurs/Simon Cowell/nuclear war cause us to abandon human dwellings, shelter, water and food are the priorities. Would my academic and professional experiences as a zoologist make me Dennis Quaid? On the face of it there is nothing in any zoology textbook that will help you stay out of the wind and rain. However very many zoologists do spend a lot of time in the field and hopefully this would stand us in good stead. We are more likely to know about prevailing winds (to chose which side of a natural structure to begin building), but this knowledge is by no means specialist. I’d like to think our experience of remote-living during fieldwork would give us an edge over the hoi polloi when it came to mentally dealing with the future that lay ahead, and the kinds of questions we’d be asking ourselves when it came to working out how to survive. What’s more, zoologists are generally quite prepared to sit still in the rain for long periods without moaning. So while our facts and science will not save us here, hopefully our experience might. [there are of course situations when zoology would save you: the ability to recognise – and avoid – a bear’s den, for example. Or the presence of a particular species of frog that indicates a cave is prone to flash flooding. But such eventualities are probably too unlikely to hang on to]. Here is somewhere that training in the ways of animals could save your life – both in terms of finding water and deciding whether it is fit to drink. Animals are excellent indicators of water, particularly herbivores, some insects and smaller birds. It’s reasonable to say that zoologists are likely to be able to recognise the signs of animals in an area. Score one for us. Following animal trails downhill and noticing if birds and are flying in a straight line without stopping are great clues of where water is. Certain bugs will tell a trained eye whether water is stagnant or polluted (and zoologists are probably more likely to be encouraged by the presence of lots of most species of pond insects to indicate water quality, rather than put off by it). Zoologists should also be able to tell you how to get water out of an animal (blood, eyes, fish spine etc). Here you would think this is where we come into our own. Surely animal-experts are the go-to-guys when it comes to tracking down animals to eat. Many of us also know how to trap and handle them from our field experience. Dissection is a dying part of zoological training (in schools and universities), but such know-how surely would help you get the best out of a kill. Knowing how animals live and function can be a big help – which bit of a crab, for example, could accumulate all the nasty chemicals humans use, and should be avoided? Why would it be a bad idea to eat a cat’s liver, but not a deer’s? So in the short term that all sounds good. Looking at longer periods we might be able to predict when migrating animals will arrive. There’s also the general biology stuff we know when it comes to understanding why and how our own bodies are failing, and perhaps what to do about it. Should we still be around when farming needed to be re-invented, pre-made experts in animal behaviour (or indeed the specific science of domestication) would be as valuable as a lighter. If you know about animals, you also need to know a bit about plants. There’d be some knowledge of ones to avoid, but it’s unlikely that zoology alone could save us here when it came to rediscovering the full gambit of bushfood which has been all but forgotten in Britain since the arrival of bananas. Despite all the help zoology gives the hunter/gatherer, it was the issue of food that my friends and I decided would eventually kill us. Finding enough of everything needed to survive for a length of time is an extraordinarily tall order, even if you can tell the difference between a seal and a sea lion.